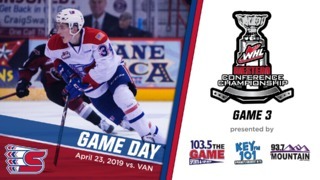 SPOKANE, Wash. – The Spokane Chiefs battled back from a two-goal third period deficit to force overtime but fell in the extra time, 3-2 to the visiting Seattle Thunderbirds on Tuesday night at Spokane Arena. Forward Alex Mowbray scored his first goal as a Chief to force overtime. After a scoreless first period, Seattle jumped on the board with a two-goal second, starting with a power play goal scored by Alexander True off assists by Ryan Gropp and Mathew Barzal at 7:34. 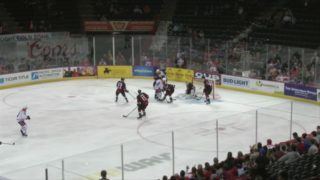 The Thunderbirds scored their second of the middle frame at the 14:24 mark with a perfect shot to the top-right corner by defenseman Austin Strand. Barzal, who made a creative play at the blue line to keep the puck in the Seattle offensive zone, earned the lone assist on the play. Eli Zummack got the Chiefs on the board with his third goal in five games, slipping in a rebound chance after a scrum in front of Seattle goaltender Rylan Toth at the 5:31 mark of the third period. Mowbray tied it at 2-2 with his first of the season and first as a Chief at the 9:11 mark of the third, with assists to Riley McKay and Reid. Mowbray threw the puck on net from the left wing and seemed to fool Toth as the shot deflected up and over the netminder’s shoulder. The Chiefs withstood a flurry from the Thunderbirds at the end of regulation, killing off 1:57 of 5-on-3 after back-to-back penalties taken by Tyson Helgesen and Hudson Elynuik. 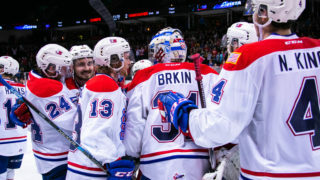 In a back-and-forth overtime period featuring multiple big saves from the goaltenders, it was Seattle who broke through for the winner as Strand scored his second of the night off an assist from forward Keegan Kolesar with 1:12 left in the 3-on-3 time. 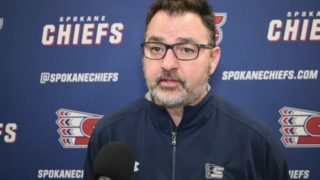 The overtime loss puts the Chiefs one point back of Portland for the eighth and final playoff spot in the Western Conference. Spokane hits the road for two straight this weekend, Friday at Kootenay (6 p.m. PT) and Saturday at Tri-City (7:05 p.m. PT). Saturday’s contest will be televised live on SWX. 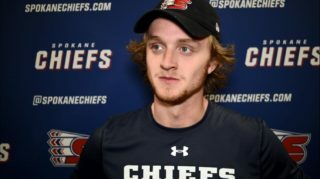 The Chiefs’ next home game is Shriners Hospitals for Children – Spokane Growth Chart Giveaway Night at the Arena on February 3 versus the Medicine Hat Tigers. The first 1,000 kids through the gates will receive a life-size growth chart poster featuring forwards Kailer Yamamoto and Hudson Elynuik. 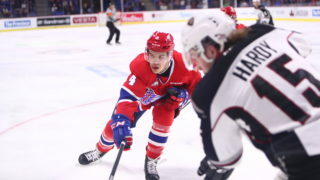 Tickets for February 3 and all Chiefs home games are available in-person at the Chiefs’ Ticket Office, over the phone at 509-535-PUCK and online at ticketswest.com or spokanechiefs.com.